This is the current month’s read over a the Cozy Mystery Corner on Goodreads. 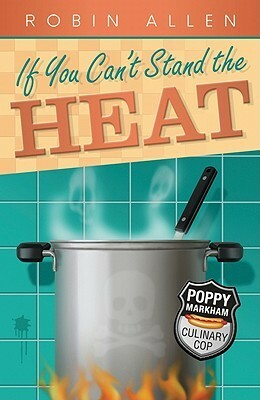 The protagonist is Poppy Markham, who comes from a long time restaurant family, but has defected to the dark side, the health inspector’s office. In this, the first book, Poppy is called back to the family restaurant which is in a state of chaos due to her father’s health, some unscrupulous villains and a murder. Poppy’s stepsister and the head chef is cooling her heels in jail and so Poppy investigates to try to clear her name and figure out all that is going on. I would have liked more explanation of Poppy’s animosity with Ursula, other than the brief couple lines discussing how her dad put Ursula above her in the restaurant. I would have also liked to see more of Poppy in her new chosen career. Most of this book was her investigating the murder. I did find the flipping back and forth between calling her dad, being referred to as Dad and then Mitch distracting. Also, the neighbors being referred to as “John With” and “John Without”. Overall, an okay cozy mystery. Sounds like an interesting book, but you’re right, a good backstory makes all the difference.